Cute Brushes! ♥ Cute-Stuffs.com! ♥ Kawaii Shop - Phone Straps, Charms, Dust Plugs & More! Cute little brushes to use for dusting your small electronics ports, or keyboards, etc. 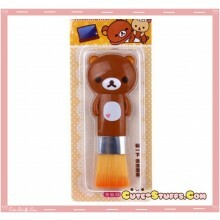 Kawaii Rilakkuma Keyboard Desk Brush w/ Heart! Cute!